I've admired now for some weeks one of my new colleagues, who have turned the very basic disturbing phone call question around. He asks in phone calls, that "Is it a good moment for you?" I amongst many others tend to ask the question other way around, " is it a bad moment for you?" The intention with both questions is the same, finding out if other person wants to talk with you or not. Doing it in the first way may just make the moment to be more suitable. 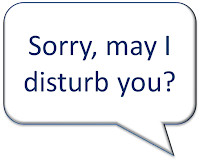 I've known couple of other persons who have this capability to disturb without really disturbing. It's a good asset for person who needs to cooperate a lot with others. It's not only about how you place your words, but it's also about how you present your subject you were disturbing for in the first place. If you still, after disturbing, present your subject as if you would be sorry for disturbing, then the one disturbed can feel annoyed about disturbance. If you continue as if you were entitled for this disturbance because the importance of the subject, then it's less annoying. Being positive and believing your subject has a positive effect on communication. People tend to be much more receptive and cooperative if you believe what you say is important and worth of the moment other gives to it. The saying: "Don't shoot the messenger" isn't always right. Poor messenger might not get the message through or make the message to be less important that it really is. Everyone knows how to speak, good communication skills on the other hand is a luxury of a few. That's the reason I try to observe others and learn from their habits, in good and bad. It takes ages to learn to communicate with different audiences and with different technologies. One morning I was heading to work, walking a short walk from train to the office. I noticed myself having my mobile in my hand and I was checking in to couple places with foursquare. I looked around and I saw couple of others doing the same (looking the phone while walking). Then I finally realized how stupid it was. Instead of enjoying walk, places and all the people around, I use my time checking in to meaningless places with mobile phone. Whole time I walked I had mobile in my hand and I constantly checked it, if I could already check in to the next place in my route. Reason for this intensive foursquare usage was my colleagues in my previous work place. We used to on coffee breaks, check each others foursquare points, mayorship's and badges. For a competitive nature as mine, it was enough for trying to gather as many points as possible in every place I was. Now without this aspect. I'm just wasting time. In that one morning I realized, that maybe I could use that time better. I could use the time for walking. Some of you might not agree with this, but walking and observing the environment you live in, is important. It's actually good time to think and see the world. It's funny how much more I have found from the routes I've been walking for some time, when I've actually used the time for looking. And every time I walk the route, it's bit different than it was last time. People, nature, cars, buildings, animals, trash or something has changed. Try it out, you'll be amazed. Some of you will think, that have I gone mad. Maybe I have, but I've just realized that I can enjoy these walking moments and not just think those to be boring empty moments I have to waste my time everyday. It's your own choice how you use your moments. I'll try to use those wisely. 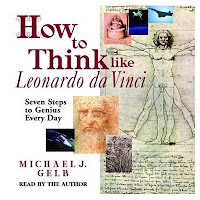 I finally finished reading the book How to think like Leonardo da Vinci by Michael Gelp. It's a book about maybe the most creative genius ever lived in our planet. At the same time it's a self help book to learn to be more creative, more focused and more yourself. Book started all fine with interesting history review of Leonardo and the time he lived in. This historical aspect continues whole-out the book and everything is reflected to Leonardo's history at some point. That makes the book both interesting and different. 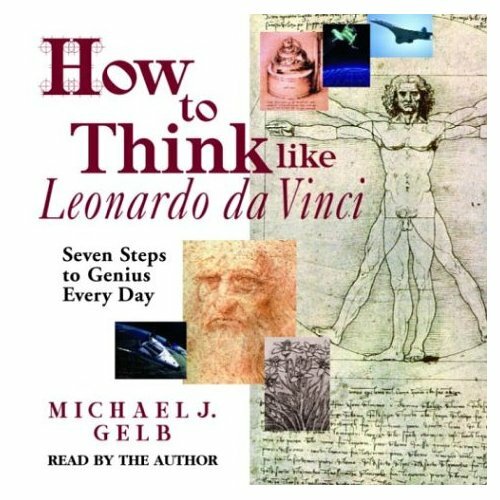 Book tells about Leonardo's findings and creations and also gives good hints on how to take those in to use in everyday life. Book is full of exercises, some of them interesting, some of them not. After a while, I got really bored with exercise after exercise. I even got the feeling, that maybe there are this many exercises because there wasn't enough other things to fill out the book. Maybe that wasn't the reason after all, but it just tells how bored I got with those. It's difficult to give a review for a book like this. I mainly liked it, but then I really hated some parts of it. I would have liked to hear more about Leonardo and theories about his work and not so much about everything else. Book turned out to be too much of a self help book for creativity. Maybe I'm bit pessimistic here, but I guess not that many have actually completed all of those exercises, which play such an important role in the book. So book loses much of it value due to it having too many and too time consuming exercises. That's a pity, since it has all the ingredients for great book. 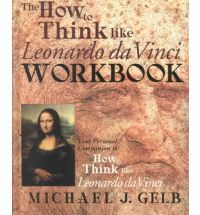 If you want to learn something about Leonardo and some ways to be more focused and more creative, read this book. It does have lot of good things in it, but still it didn't hit the jackpot for me. Year 2011 is so over. My last years review was so popular, that here's a new one for the year 2011. Here's my favorite blog posts from me and others, most important books I've read, and also something else. Healtland - Site from Time concentrating on healt related issues. There has been introduced lot of interesting studies and stuff ongoing all over the world. I don't know why, but I've enjoyed reading it. HBR.org - The Management Tip; Good advices to everyone in worklife, not just for managers. Kinetic Revolution - Coaching blog: Blog with lots of good information for runners and other endurance athletes. Good articles on training and other related subjects. Jim's Marketing Blog - Even though I'm not really into marketing and Jim can be quite a marketing guy, I've enjoyed this blog a lot. There's been interesting topics around lot other things than just marketing. I recommend to check it out. Other than these blogs I've still enjoyed a long time favorites Dan Pink, Seth Godin and Jeff Jarvis. All of them are my favorites in their own field. 2. Is Google+ invite only just a marketing trick? And the 3 least popular posts of my blog. All of those are in my opinion are from the better half of my posts. For some reason no one just found those. 3. Do you need to live you work in order to be good on it? I published 103 posts in year 2011. Lots of those got much more readers than I was expecting. Thanks for everyone who visited the site and enjoyed it. I hope I will be as active in 2012 also. I do this, because I like it. Thanks.